Decided to resurrect an old thread idea. 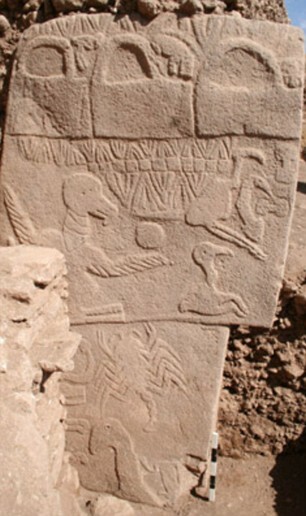 Anyone heard of Gobekli Tepe? Fascinating archaeological find in Turkey (1995) that is turning heads. Carbon dated to around 10,000 bce, the semi unearthed megalithic structures suggest a whole different perspective of what our ancestors were and what they were doing. The site was intentionally buried around 8,000 bce, no one is sure why. The structures are circles, Stonehenge-esque, made of sharp edged 10-15 ton monoliths, with bas-relief carvings ( images below ). The really interesting part to me is that this kind of organized building indicates more than a 'hunter gatherer' society well before most 'established' or 'accepted' time lines. I'm familiar with this and a few other cases like it. The ancient aliens theory is pretty popular, the whole think is fascinating to me. I think perhaps as you say we had a much more advanced society than the hunter gatherer story we've long been led to believe. If that's the case, perhaps they where subject to an extinction event caused by nature or their own dabbling in technology. Robert Schoch is hypothesizing that the last ice age ended dramatically, in maybe a period of less than 3 years, due to a coronal mass ejection, something that would literally dwarf the Carrington event back in 1859. 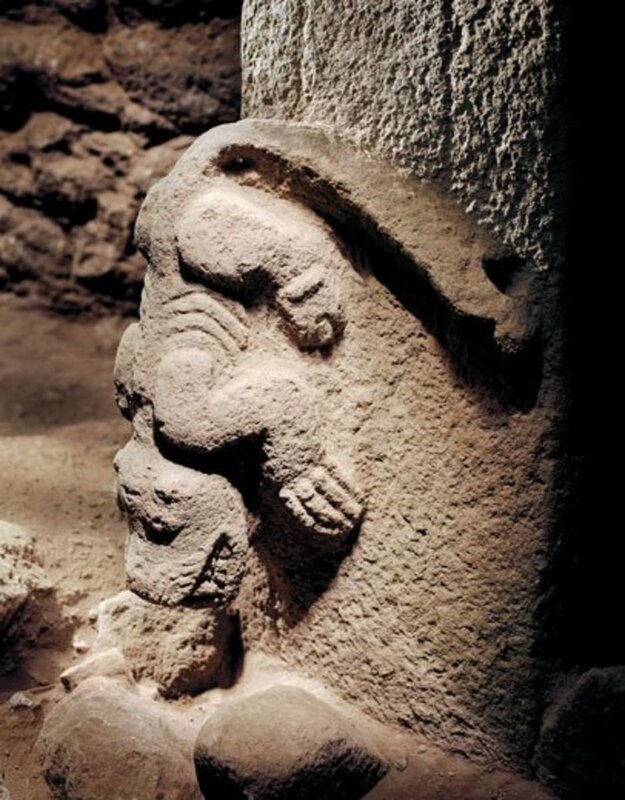 Schoch is the PHD geologist ( Yale graduate ) that challenged the accepted age of the Sphinx in the early 90's before Gobekli Tepe was discovered. He suggested water erosion indicated that it was much older and at the time was ridiculed by many who argued 'there's no evidence of a civilization that could have done this'. Carbon dating at Gobekli ( something unavailable with the Sphinx ) has so far proven otherwise. Graham Hancock also has some pretty interesting stuff on ancient civilizations, you should check out his work, Fingerprints of the Gods especially. I get his science report once a week! Mostly because I'm lazy and it's usually full of very interesting new stuff/links, and, it's pretty much not about him at all. ( as in, he's not promoting anything but science ). Hancock has an astounding body of work, his work on precession with sites from around the world is pretty interesting stuff. Ive been a fan of Graham Hancock ever since hearing him speak on Joe Rogans podcast. we've already got our tinfoil helmets on. Anyone a fan of speculative technologies? Huge fan of Ray Kurzweil. Transcendent Man was great Bender. Along these lines Google released a video today, it features glasses that are working on right now that basically replace a smart phone. I think the whole idea of the exponential growth of technology is amazing, and one that I think is an elusive obvious. Every piece of technology that is adopted becomes the backbone for the next innovation until there is a new paradigm shift. It's interesting that people still talk about some things like they won't see them in their lifetimes. Nobody thought we'd be able to clone an animal in our lifetimes a short while ago - same goes with the genome project. I think Kurzweil is right, in just 15-20 years I think we'll see an enormous leap in technological advancement. I find it funny though, that some people are actually bemoaning this (even though it's pretty much inevitable). "Only rich people will benefit" - the stats prove otherwise, there are fewer living in poverty BECAUSE of technology. "We're going to lose our humanity" - Yeah, well if you're so worried about that then why aren't you living in a forest, hunting and foraging for your food, because thats what the human body was essentially adapting to. And while you're at it, you can have your 25 year life expectancy back. Interesting study shows that carbon dioxide and not changing climatic trends responsible for the demise of the last ice age. Skeptics who believe that global warming is just a natural part of climatic change occurrences, now cannot ignore the fact that CO2 (chemical symbol for carbon dioxide) may have been more so the culprit in triggering weather circumstances that led to the melting of the last ice age, some 10,000-20,000 years ago. What does this findings implications have for Earth and the state of our climate? A significant increase in carbon dioxide in the atmosphere, rather than changes to the Earth's orbit, was likely the main cause of global warming that ended the last ice age, a new study has found. "It's obviously a significant change for the planet… I think this just provides a very palpable, tangible example of what rising CO2 can mean for the planet over the long term." The analysis of historic temperature and atmospheric carbon dioxide data teased out of 80 ice and sediment cores from around the world also strongly discredits an argument used by some global warming skeptics to support the belief that rising carbon dioxide in the atmosphere does not cause the Earth to warm. As the ice age came to a close, the amount of carbon dioxide in the atmosphere rose from 180 parts per million to 260 parts per million over around 7,000 years. Shakun said current carbon dioxide levels in the atmosphere are around 390 parts per million, and they've risen about 100 parts per million over the last century, comparable to the amount they rose when the last ice age ended. However, he said, it will take centuries to see all the effects of the recent and the continuing increase in carbon dioxide levels, due to the "huge amount of inertia" within the Earth's climate systems. While the current increase in atmospheric carbon dioxide has been caused by human activity, Shakun said it's not clear exactly what caused the rise at the end of the last ice age. However, the theory is that the changes to the Earth's orbit caused more sunlight to hit the northern hemisphere, melting some of the ice sheets. The influx of freshwater into the North Atlantic disrupted ocean currents, causing the northern hemisphere to cool and the southern hemisphere to warm. The warming in the southern hemisphere may have allowed carbon dioxide to escape from the depths of the southern oceans by melting the sea ice that capped the oceans and kept the carbon dioxide trapped. Higher temperatures may also have strengthened winds that could help pull the carbon dioxide from the water into the atmosphere.